Custom intelligent apps for faster, better decisions. Are you facing a unique data challenge ? We can build a custom solution using the latest Microsoft technologies. You can't manage what you can't measure. 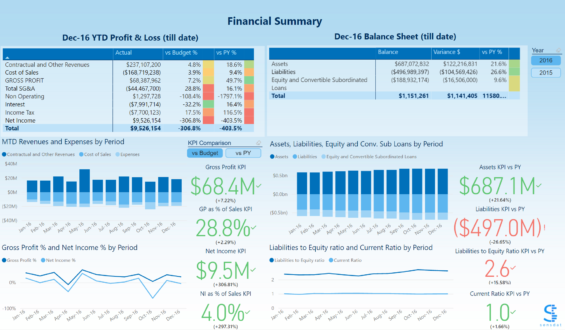 A modern finance function relies on near real-time information in interactive dashboards and effective collaboration options. Our range of solutions for finance departments enable you to automate all your financial reporting and gain deep insight on your cost drivers, accounts payable, accounts receivables and Cash-Flow statements. Sales teams and managers need precise and crystal clear information to understand customers and sell more effectively. We help you not only to gain a complete view of your current sales performance and new insights to drive sales across the organisation, but also to incorporate external datasets - such as public data or weather data - for unparalleled insights and intelligence. Procurement teams and managers need a clear visibility on stocks and lead times together with an understanding of sales to optimize stock levels. We help you merge insights that are derived from both your warehouse management system and your sales system to enable you to act faster: order the right items at the right time and at the right place and as a result minimize lost business due to stock unavailability. Build on Proven Process and Intelligence. Power BI is a cloud-based analytics platform developed by Microsoft. It is a powerful and flexible tool that enables us to transform your raw data into actionable insights, and create stunning, intuitive dashboards for your business functions. Azure Analysis Services is the new cloud version of the world’s #1 selling analytical engine. 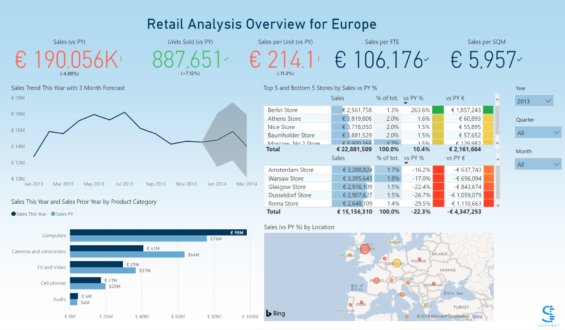 It combines your multiple data sources and performs calculations in a secure and scalable single version of the truth, that we can visualize with Power BI. Microsoft Azure is a cloud computing service invented by Microsoft for building, testing, deploying, and managing applications and services through a global network of managed data centers.